Not only does the Tournament mark the start of a three-week marathon of triumph, heartbreak, “celebrification” of elderly women, and unlikely heroics, it also represents the final opportunity for NBA scouts to get an in-game look at the top prospects for the 2019 NBA Draft — and an opportunity for fantasy gamers to see who they might want to target next season. 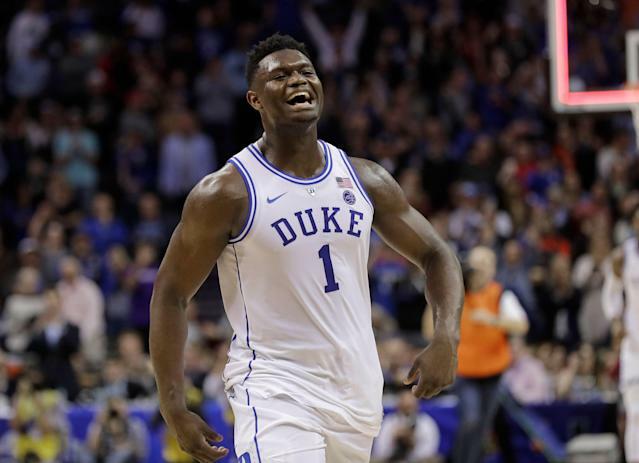 The name atop most draft boards is a familiar one, but Zion Williamson is far from the only first-round talent set to take the floor this weekend. Owners of the No. 1 overall seed, Duke’s roster alone may be home to as many as four first round picks. Williamson’s five-star teammate, R.J. Barrett, is a virtual lock for the top-five — and probably the top-three — while Cam Reddish, another five-star recruit, seems destined for the lottery, despite a mostly underwhelming freshman campaign. While this is shaping up to be a top-heavy draft — one that projects to drop off considerably from No. 1 to No. 2, and from No. 3 to the rest of the lottery — plenty of talent will be on display across the country, as prospects utilize the national stage as a final audition before the more individualized pre-draft process begins in earnest. There’s not much left to say about Williamson, who’s the most captivating college player in recent memory and the near-consensus No. 1 prospect in the class. Williamson’s combination of size, power and jaw-dropping athleticism was no secret coming out of high school, but he’s done just about all he could do to answer questions about whether his overwhelming physical gifts would translate against vastly better competition. He’ll have to answer those same questions again at the NBA level, but barring a catastrophic injury, Williamson will be the first player to walk across the stage at the Barclays Center on June 20. It wasn’t all that long ago that Barrett was considered the superior prospect to Williamson, and while that’s no longer the case, the Canadian has had a fantastic freshman season in his own right. The ACC’s leading scorer (22.9 PPG), Barrett has all the tools you look for in a lead NBA guard. He’s long (6-7), athletic and a relentless attacker off the dribble, and while he’s a fine passer, Barrett can be prone to forcing things around the rim. Still, the confidence Barrett exudes is more James Harden than Dion Waiters, and his shooting — arguably his biggest question mark — has improved throughout the season. Plus, Barrett is still only 18 years old, having reclassified to join the Blue Devils a year earlier than initially expected. Over the next three months, expect Barrett to jockey with Murray State’s Ja Morant for the title of Best Player in the Draft Not Named Zion Williamson. While Little has had difficulty finding his role in a deep Tar Heels rotation, Reddish averaged more than 33 minutes per game in conference play, but he shot just 34.6 percent from the field, including 31.2 percent from three. The latter number is particularly problematic, as three-point shooting was considered one of Reddish’s best traits as a prospect. Even given those struggles, Reddish remains firmly in the lottery conversation, which speaks not only to his immense potential, but also to the amount of uncertainty after the top-three. At 6-8 with elite athleticism, Reddish fits the physical prototype for a Paul George-style NBA wing, and there’s an argument to be made that he’ll flourish in the more space-friendly pro environment. While he may need more seasoning than initially expected, Reddish still has one of the highest ceilings of any player in the class. Like his brother, Tyus, four years ago, Jones came to Duke as a borderline-one-and-done who’s played his way into the conversation at the back-end of the first round. Tre is a similar prospect to Tyus in that they’re both undersized, defensive-minded distributors, but Tyus was a markedly better shooter at the college level, knocking down 38 percent of his threes, compared to Tre’s 25 percent. The younger Jones is a bit slighter, though he’s a comparable passer and may be an even better defender (3.3 STL per 100 poss.). That said, the shooting must improve for him to climb into the top-20 discussion. Fall is more of a “name to know” than an NBA prospect, despite the fact that he’s the tallest player in the country. Listed at 7-6, 310 pounds, Fall finishes everything around the rim and blocks 6.0 shots per 100 possessions, but at some point tall becomes too tall. Like other mountainous prospects in the past (personal shoutout to Kenny George), his limitations outside of the restricted area make him nearly impossible to put on the floor in the modern NBA. Currently projected in the mid-to-late first round, Alexander-Walker has teamed with Justin Robinson to lead the Hokies to a four-seed in the East Region. The sophomore has improved nearly across the board after an encouraging freshman campaign, and he’s demonstrated more playmaking ability (4.0 APG), while remaining an efficient scorer from the field (47.8% FG) and from three (38.1% 3PT). Alexander-Walker isn’t a top-tier athlete, but at 6-6 he makes up for it with elite length for the position. Firmly a second-round prospect at this point, Reid’s production and floor-spacing are encouraging, but it’s tough to project where he might fit at the next level. At 6-10, the freshman is a true power forward by position, but he’s more of a powerful, lumbering athlete, rather than the type of quick-twitch player who can stick with NBA fours on the perimeter. Reid reminds me of Caleb Swanigan, who was incredibly productive at Purdue but is yet to find his niche in the NBA. Building off of an encouraging freshman campaign, Fernando has steadily climbed up draft boards this season, and he’s now in the mix in the late-lottery. A First Team All-Big Ten selection, Fernando averaged a double-double as a sophomore while flashing improved passing (2.0 APG) and shot-blocking (1.9 BPG) ability. The 20 year old is a powerful athlete around the rim on both ends — and he’s a plus free-throw shooter for a big man — though at this point in his development he doesn’t do much to space the floor (3-of-11 career 3PT). The most exciting mid-major player since Stephen Curry, Morant capped his ridiculous sophomore campaign — during which he became the first player in D1 history to average at least 20 points and 10 assists per game — by leading Murray State to the OVC Tournament title and a berth in the NCAA Tournament. All eyes will be on Morant when the 12-seed Racers take on Marquette on Thursday, but regardless of whether he’s able to pull the upset, Morant will hear his name called in the top-five come June. A rare blend of elite athleticism, ball-handling and passing vision, Morant led the nation in assists and points produced behind a Westbrookian 50.9 percent assist rate. Like Westbrook, Morant uses a ton of possessions and can be prone to questionable shots and turnovers, but given his superior talent and circumstance, that’s forgivable at the college level. Morant will need to improve as an outside shooter — he’s shooting a streaky 33.6 percent this season — but entering the Tournament he’s firmly in the discussion with Barrett for the No. 2 spot behind Williamson. The WCC Player of the Year, Hachimura lived up to the hype after a breakout sophomore season, finishing his third year in Spokane with averages of 20.1 points, 6.6 rebounds, 1.6 assists and 1.0 steals per game. While he does most of his work around the rim (60.9% FG), Hachimura made strides as a selective three-point threat (46.9% 3PT on 32 attempts), but it’s his athleticism and defensive potential that make him a lottery prospect. 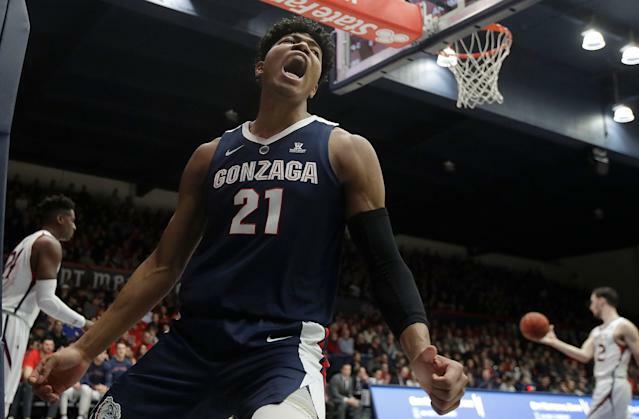 Hachimura might be the face of the program — both nationally and internationally — but Clarke may be the biggest reason the Zags are back on the one line yet again. A transfer from San Jose State, Clarke sat out last season but returned to the floor and led the WCC in virtually every defensive metric, while posting the best offensive rating (140.1) and second-best PER (37.2) in the nation. Clarke is among the best shot-blockers in the draft, and he also rebounds well and finishes around the rim as efficiently as anyone in the country. He’s not an elite playmaker, but Clarke has an array of face-up moves and looks mostly comfortable attacking off the dribble in the half-court. Some teams might ding Clake for his age — he’ll turn 23 before the start of next season — but he still projects as a late-lottery/mid-first-round prospect heading into the Tournament. The Big 12 Player of the Year and Wooden Award Finalist, Culver is the heart and soul of the three-seed Red Raiders. Culver shot 48.6 percent from the field and averaged 18.5 points, 6.3 assists, 3.6 assists and 1.3 steals as a sophomore. While his three-point shooting lagged a bit (32.3% 3PT), he’s one of the more well-rounded prospects in the class. A likely top-10 pick, Culver may not be a superstar at the next level, but he does virtually everything well and should be an impact player on both ends in the mold of a Caris LeVert type. The South isn’t exactly brimming with lottery talent, but Hunter stands out as easily the best NBA prospect in the region. Injured for last year’s devastating loss to UMBC, Hunter returned to school for his redshirt sophomore season and has developed into a possible top-five pick. The ACC Defensive Player of the Year is probably the best all-around defender in the country, and while his offensive ceiling may not be sky-high, he’s a proven 15-point-per-game scorer in the one of the nation’s most methodical offenses. Hunter hit 38.2 percent of his threes as a redshirt freshman, and that number is up to 45.7 percent this season on higher volume. If Tony Bennett could conjure up the perfect Virginia player in a lab, the result would look a lot like Jerome. Nothing about him necessarily screams NBA prospect, but he’s a calming, high-IQ presence, and at 6-5 he has the size and vision to make it as a backup point guard. The junior is a below-average athlete who sometimes struggles inside the paint, but he’s a very good three-point shooter and defender, given his athletic limitations. Think Kyle Anderson with a better outside shot. Unsurprisingly, the blue bloods carry most of the weight in the Midwest Region, which is led by White and Nassir Little, both of whom could come off the board in the lottery. Little began the year as an incumbent top-five pick, but it’s White who’s played his way into the mix. The 25th-ranked recruit in the 2018 class by 247Sports, White burst onto the scene in November with 33 points against Texas in the Las Vegas Invitational and never looked back. He topped 30 points twice more in ACC play, highlighted by a memorable 33-point outburst in a narrow win over Miami. At 6-5 with a strong frame, White certainly looks the part of an NBA point guard, but he’ll face questions about his defensive ability and score-first mentality. Little came to Carolina as Roy Williams’ highest-ranked recruit since Harrison Barnes, but his freshman campaign has been decidedly underwhelming. Little has had some moments — most notably, a 26-point, six-rebound, three-assist effort vs. Virginia Tech — but he never truly found his place in the rotation and made it through the regular season without starting a single game. Williams isn’t exactly John Calipari when it comes to expediting the path to the NBA, but the expectation was that Little would be too talented to keep off the floor. Instead, Little has struggled to assert himself when given the opportunity, and his stock has fallen accordingly. Johnson has good size for a wing and has been one of Kentucky’s most consistent freshmen, averaging 13.5 points, 5.8 rebounds and 1.6 assists while shooting 38.8 percent from three, in 33 games. Johnson isn’t an overwhelming athlete or particularly nasty defender, but he’s the type of solid rotation wing NBA teams covet. Herro was a big deal as a prep star in Wisconsin before he spurned the Badgers for Kentucky, but even his biggest supporters probably didn’t imagine he’d be a first-round pick after one year. Herro is by no means a lock for Round 1, but he’s exceeded expectations thus far, flashing a more diverse offensive game beyond deep three-point range. A better athlete than he’s given credit for, Herro can get to his spots off the dribble, but he’ll face plenty of questions about his strength and defensive capability against NBA-caliber athletes. Returning to Lexington for his sophomore season has vaulted Washington from second-rounder to potential late-lottery pick. He’s shared the offensive workload with Herro, Johnson, Reid Travis, and Ashton Hagans, but Washington may have the highest upside of any player on the roster. A rangy athlete with long arms, Washington has improved his outside shooting to 41.9 percent this season after hitting only 5-of-21 attempts as a freshman. Johnson has made another leap this season, his second in Chapel Hill after transferring in from Pittsburgh in 2017. The ACC leader in three-point percentage (46.5% on 5.7 3PA/G), Johnson is an intriguing combination of size and shooting, though he’s not overly physical and doesn’t defend at an elite level for his size. As an older prospect who will turn 24 midway through his rookie season, Johnson’s draft upside is likely the late-first-round.